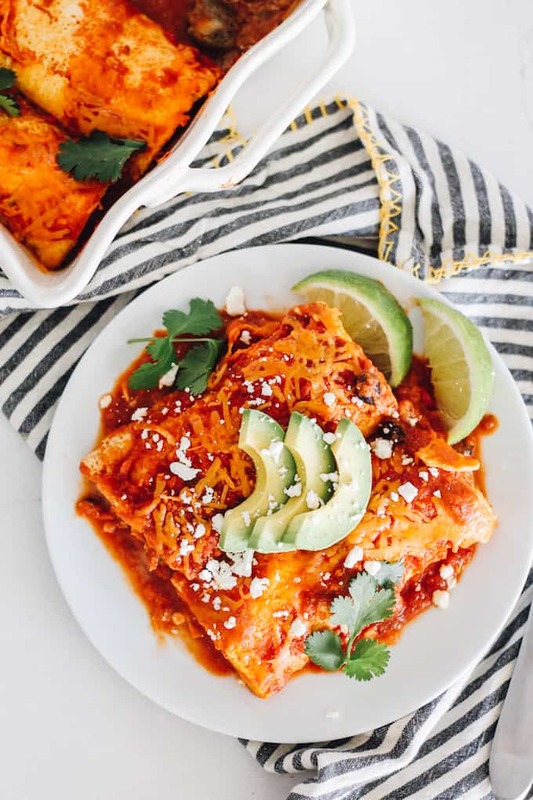 If I had the forethought to plan out my meals each week, enchiladas would most definitely be on the menu every time. 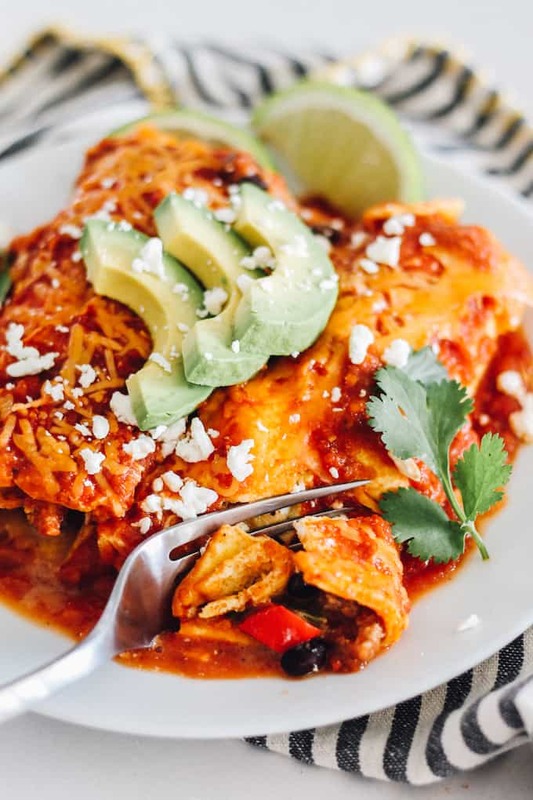 With countless ways to fill them (hello meat, veggies, eggs, and/or cheese) and the different sauce options to choose from, I’d have plenty of flavor combinations to make hundreds of different enchilada varieties. 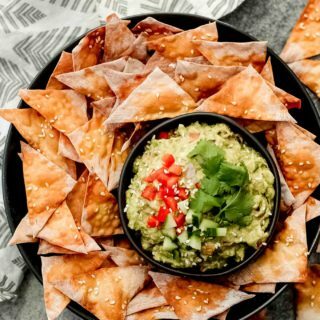 Most recently, I’ve even discovered different ways to swap out the traditional flour or corn tortilla for lower carb or more nutrient-rich options like thinly sliced zucchini and collard greens. I’ve got those swaps in my back pocket for possible future recipes. Today we’re concentrating on the most genius tortilla swap discovery: the egg tortilla! 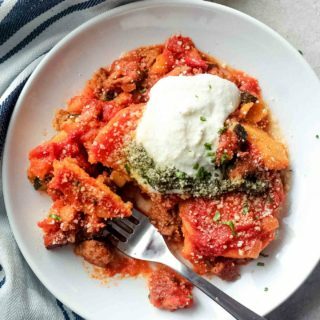 On a recent episode of The Chew, Carla Hall made a recipe for breakfast lasagna, but instead of using traditional lasagna noodles, she replaced them with sheets of baked egg. This got me thinking about the idea of using the same baking sheet concept to make egg tortillas. The “tortillas” would end up being slightly smaller than average and rectangular-shaped rather than round, but if the egg tastes the same regardless, no big deal, right? It really came down to a “Would you rather…” type situation. Would you rather stand over a stove, individually cooking and flipping 8+ round egg tortillas? Or, would you rather pour the eggs onto a couple baking sheets and get at least 6 tortillas done at one time? Option #2 seemed to make the most sense, and the results turned out wonderfully! Generously grease the baking sheets with cooking spray. Pour about 1 1/4 cup of egg mixture onto each sheet. Let the egg sheets cool for a couple minutes before slicing them into 3 rectangles. Use a thin spatula to gently lift the egg from the baking sheets. Don’t worry about tears in the egg. The tortillas are long enough to reinforce any breaks in the egg when rolling up the filling. 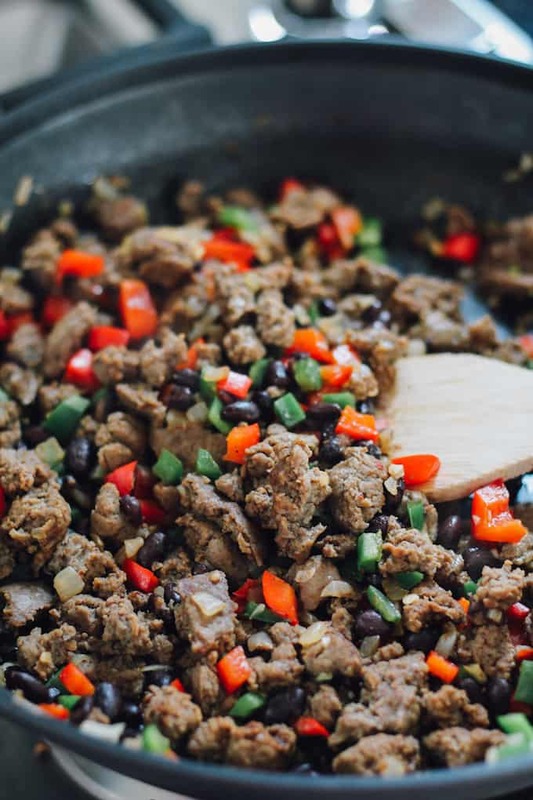 For the filling, I added some peppers, onions, black beans, and breakfast sausage to a skillet and sautéed until everything was cooked through and softened. 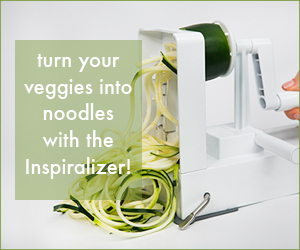 Feel free to mix things up and use your favorite meat and veggies in the filling! 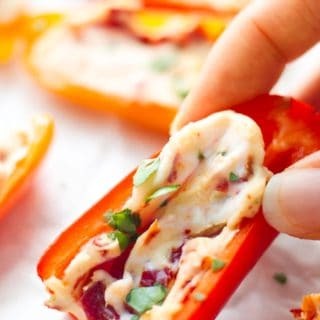 For an extra creamy finish, add a dollop of sour cream or Greek yogurt to bring everything together. For the enchilada sauce, I did something a little out of the ordinary. In a food processor, I combined chipotle peppers in adobo sauce for some smoky flavor with a jar of regular restaurant style salsa. To that, I added about a 1/2 cup of water to the sauce, which helped to even out the concentrated flavor and create the perfect saucy texture. Another option? Use store-bought enchilada sauce! 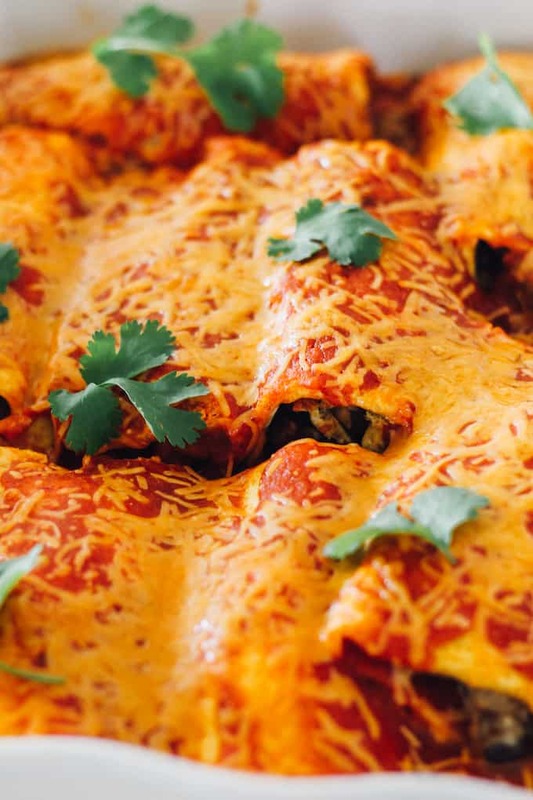 Slather those enchiladas in the sauce, top with cheese, and pop them in the oven until the cheese is melted and bubbly. 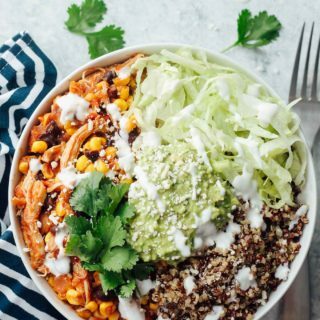 Choose your favorite toppings like sour cream, avocado slices, or cilantro, and then dig in! 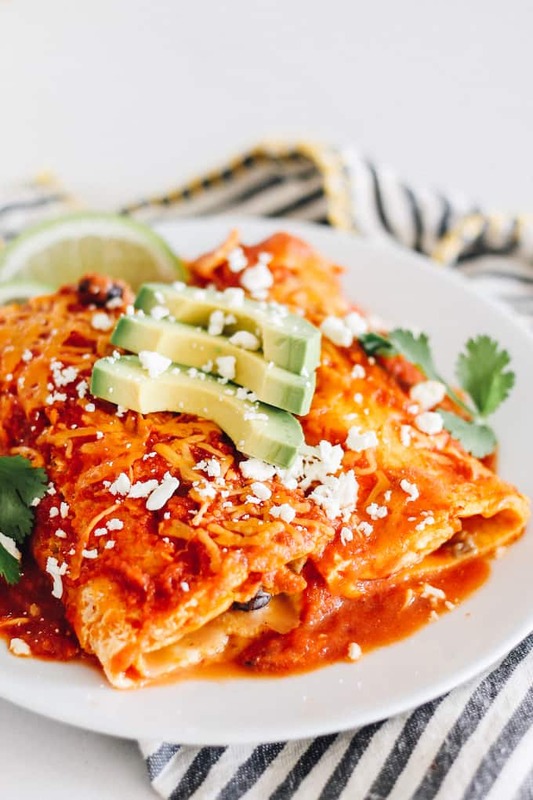 It’s breakfast enchiladas to the extreme with the most unique low carb egg tortilla! With Cinco de Mayo tomorrow and Mother’s Day brunch on the horizon, there are plenty of reasons to add this to your menu! Or if you’re an enchilada fan like me, no holiday needed. They’re great any time of the year or day and they make really good leftovers. 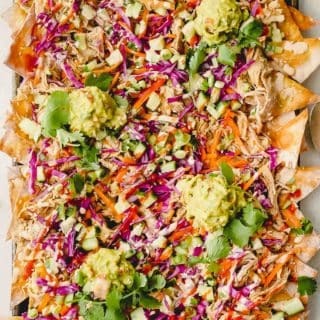 All week my husband has chosen these Egg Tortilla Enchiladas over Asian chicken slaw for his work lunch, which only means I’ll be making another batch so I can enjoy them next week! Make the egg tortillas: Preheat the oven to 400 degrees. Grease 3 baking sheets with cooking spray. * Whisk the eggs, milk, salt, and pepper together. Pour equal portions of the egg mixture onto the baking sheets. Bake for 6-7 minutes until the eggs are set. Let the eggs cool slightly on the tray. Make the enchilada sauce: While the eggs are baking, add the salsa, chipotle peppers, and water to a blender or food processor. Process until smooth. Set aside. Make the filling: Add the onion and turkey sausage to a large pan over medium heat and saute until the sausage is cooked through. Add in the spices, garlic, black beans, and peppers. Cook for a couple more minutes. Then, stir in the sour cream or Greek yogurt. Assemble: Grease a 9 x 12 casserole dish with cooking spray. Layer about ⅔ cup sauce on the bottom of the casserole dish. Slice the egg sheets into thirds to create 9 egg tortillas. Place equal portions of filling into the center of each egg tortilla. 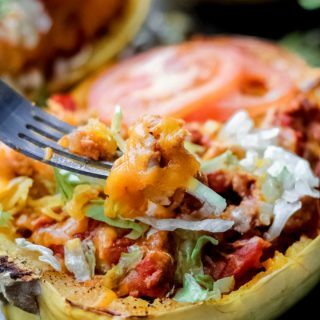 Roll up like an enchilada and place into the prepared casserole dish. Repeat with the remaining tortillas and filling. Pour the enchilada sauce over the top and sprinkle with cheddar cheese. Bake: Bake for about 15 minutes until the cheese has melted. Top with extra sour cream, avocado slices, and cilantro. * You may need to repeat this step once or twice depending on the number of baking sheets and oven space you have.